I am going to recount today’s minor Mohawk Valley adventure, not so much because it was an exciting adventure, but because it will advertise an upcoming event local readers may like to go to. Regular readers know I like to crochet and watch movies or television. The only thing I know how to crochet is afghans, and I have gotten pretty fast at making them. As you may guess, they can pile up. My solution is to donate them to worthy causes. When I see a poster for a benefit fundraiser with a Chinese auction, I try to give a call and donate an afghan. I’ve written about this before, not in the interest of tooting my own horn (I do that on Toot Your Horn Tuesday), but to call attention to one of my favorite things: people helping people. I truly believe that we are the answers to each other’s prayers (but never mind the half-baked philosophy; that goes on Lame Post Friday). Today’s cause is Rocky Rockwell, a local veteran who suffered a demolished home in recent flooding. I believe this is the second time his home has suffered damage, and this time it was much worse. I knew some time ago about the Flood Relief Benefit for Rocky Rockwell on Sept. 30. Well, you know how it is: when you know you’ve got to the end of the month to do something, you just naturally put it off. At least I do. If you do not, well that is an excellent habit to be in. Keep up the good work. Be that as it may (one of my favorite expressions), I finally called the number for the benefit organizers and found out I could drop the afghan by their meeting tonight at the VFW. So I did. I told you it was not all that exciting of an adventure, didn’t I? BUT I think it will do as a plug for the benefit. It is this Saturday, Sept. 30 from 2 to 6 p.m. at the Herkimer VFW, 129 Mohawk St., Herkimer, NY. You can find out more at the Facebook Event page (I love Facebook Events). A motorcycle ride precedes the benefit, and at the benefit there will be a DJ, raffles, food, a Chinese auction, and cash bar. I’ll be there, checking to see how many tickets get put in for my afghan. Posted in Community Events, humor, personal and tagged afghan, blog post, chinese auction, Flood Relief Benefit for Rocky Rockwell, fundraiser, Herkimer, Herkimer VFW, Mohawk Valley adventures. Bookmark the permalink. I thought I would use today’s post to plug a fundraiser I will be privileged to participate in on Saturday. 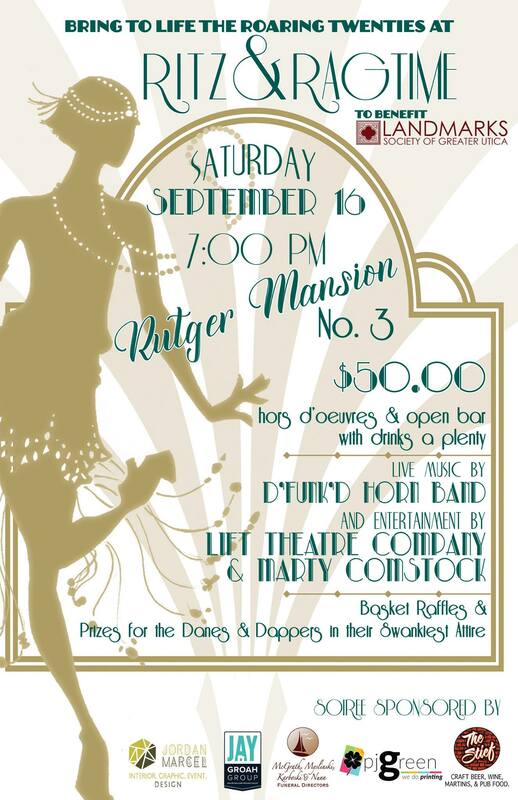 “Ritz and Ragtime” will benefit the Landmark Society of Greater Utica on Saturday, Sept. 16 at 7 p.m. at the Roscoe Conkling House, 3 Rutger Park. There will be food, drinks, and entertainment. I will be part of the last mentioned. I’m in the red dress, being strangled. 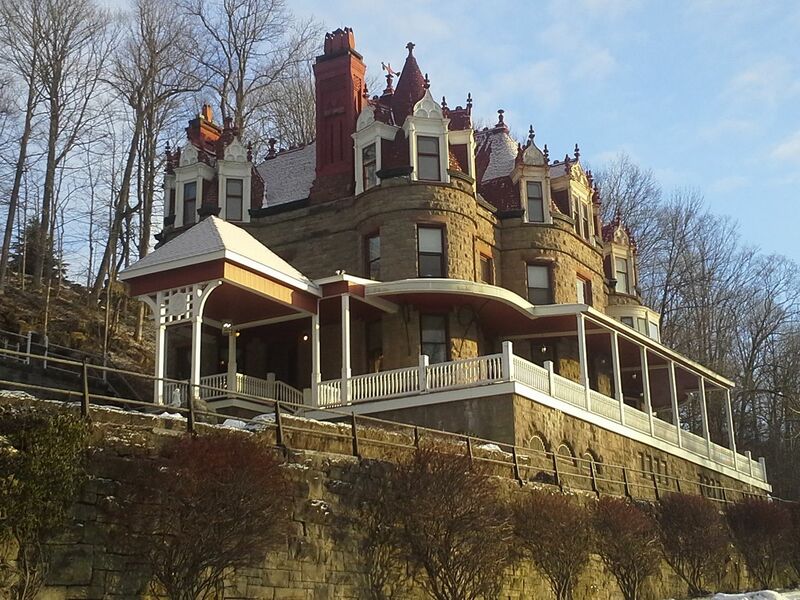 Longtime readers may remember a little event called Rubbed Out at Ruby’s, which was presented by LiFT Theatre Company at the Overlook Mansion in Little Falls. 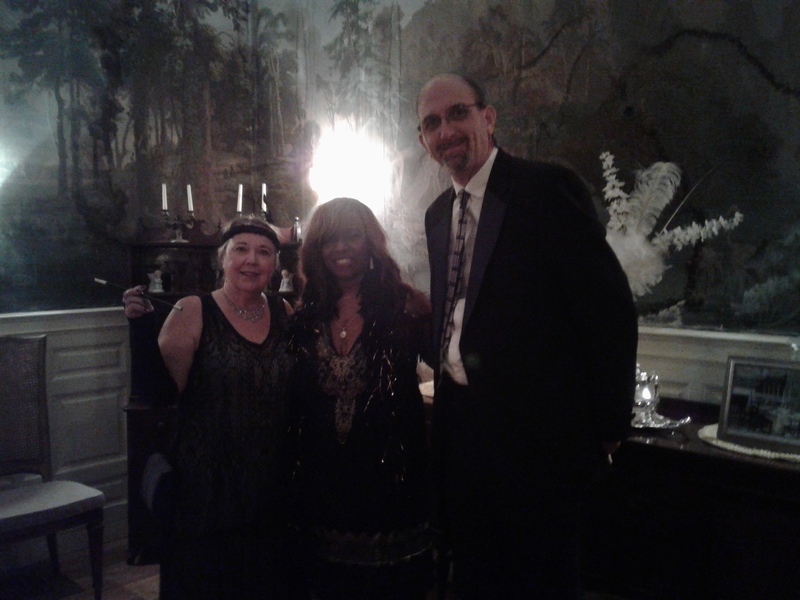 I wrote it and was featured as Ruby Van Rensselaer, a rich society lush, uh, I mean lady. I am going to reprise the role on Saturday. 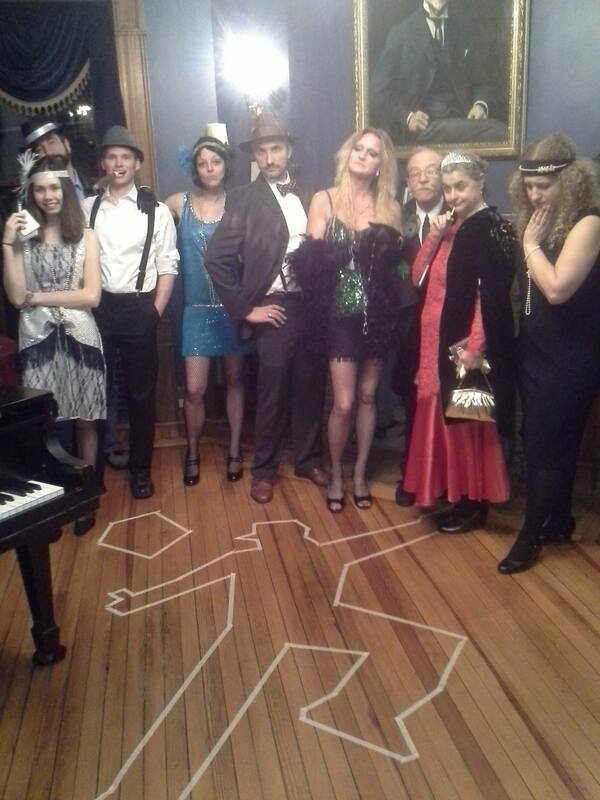 We aren’t going to present the murder mystery, or even a real story. 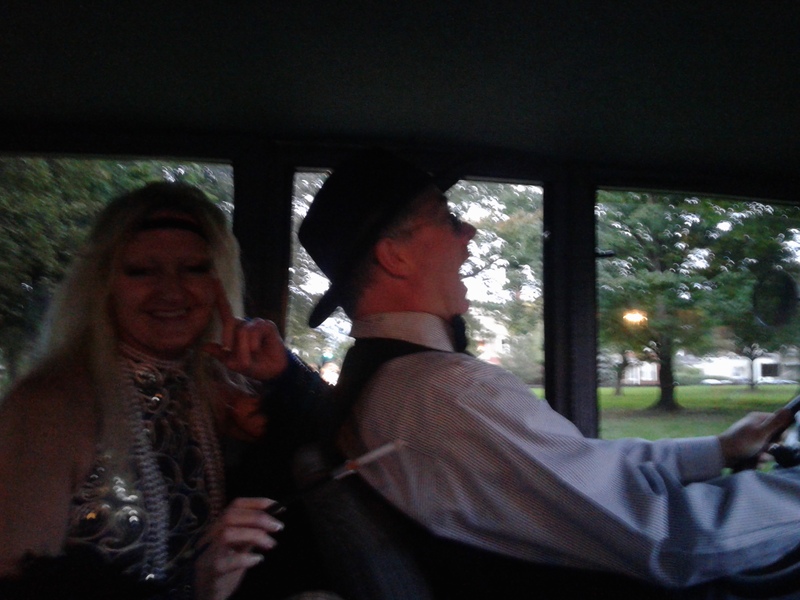 We just get to dress up and interact with the crowd in 1920’s character. It should be fun! I’m not sure how many of the original Ruby’s cast will be there, but I know some of us are really looking forward to it. 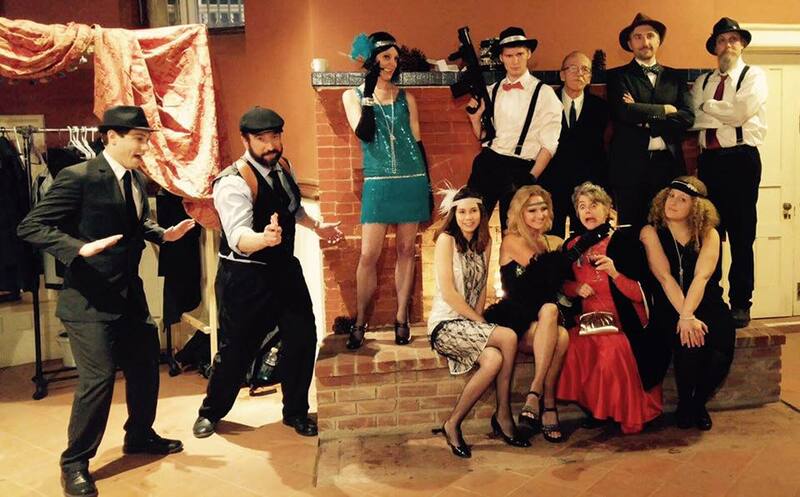 We are rather a suspicious-looking lot, aren’t we? Alas, no chalk outlines on Saturday! 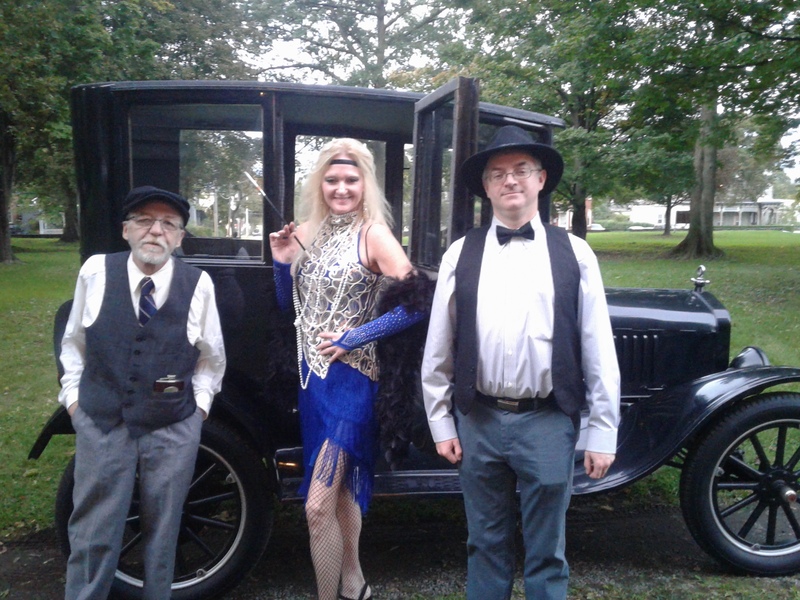 Posted in humor, personal and tagged 1920s, 1920s costumes, acting, blog post, community event, costumes, fundraiser, in character, Landmarks Society of Greater Utica, preview of coming attractions, Ritz and Ragtime, Rubbed Out at Ruby's, theatre. Bookmark the permalink. 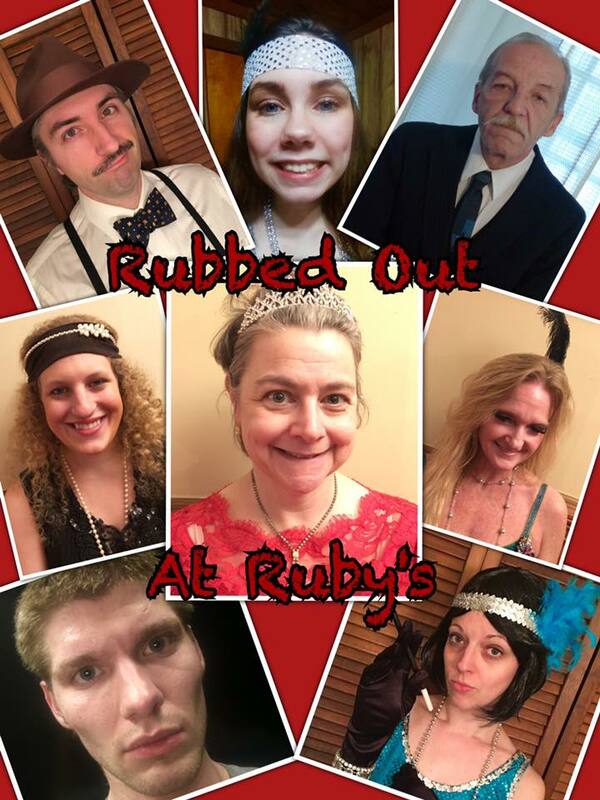 First up is tonight’s revival of Rubbed Out at Ruby’s, the interactive murder mystery that was presented to great acclaim at The Overlook Mansion in Little Falls (all my murder mysteries are presented to great acclaim, or at least I say so). 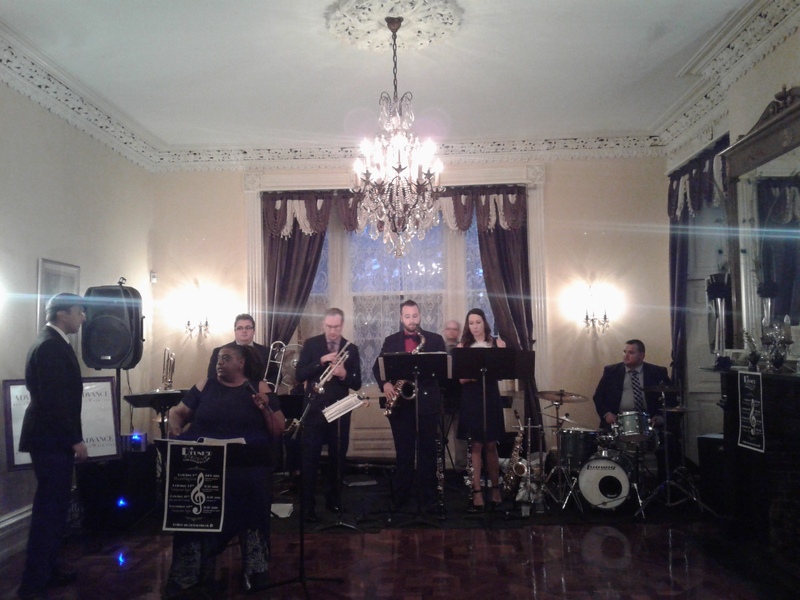 We are putting it on again for a private party. Woohoo, LiFT Theatre Company is in demand! This was the original cast. We had to re-cast a couple of parts. Tomorrow, I’ll be with LiFT Theatre Company once again, when we meet for the first read-through of The Tempest, our Shakespeare production for the summer. I will be sure to make lots of posts about that as rehearsals start and keep my local readers updated on performances. You’ll have lots of chances to catch this one! 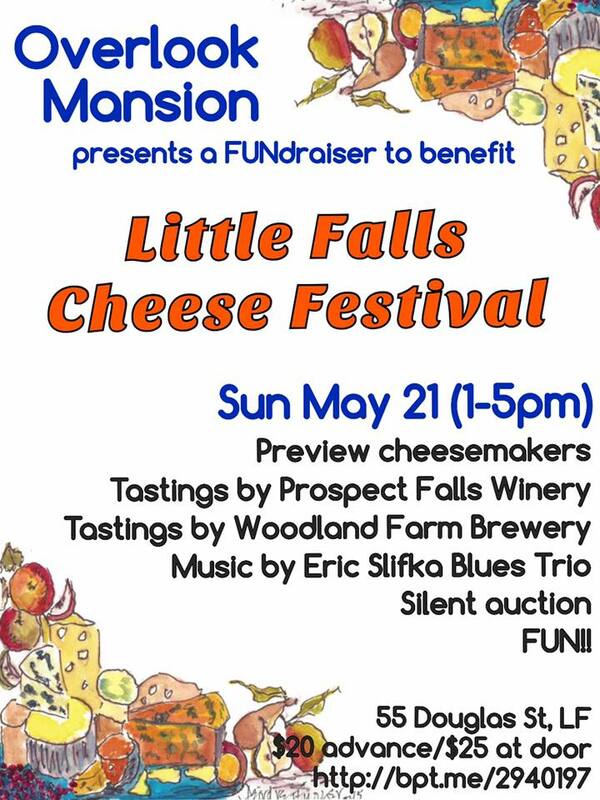 Sunday, when I ought to be doing laundry and cleaning my house (oh yeah, and writing my novel), I will be heading to the Overlook Mansion for a fundraiser for the Little Falls Cheese Festival. I will be a mere attendee at this event, instead of a participant, as I will be for Rubbed Out at Ruby’s and The Tempest. I expect it will make a lovely blog post. I see I have come full circle on this post. 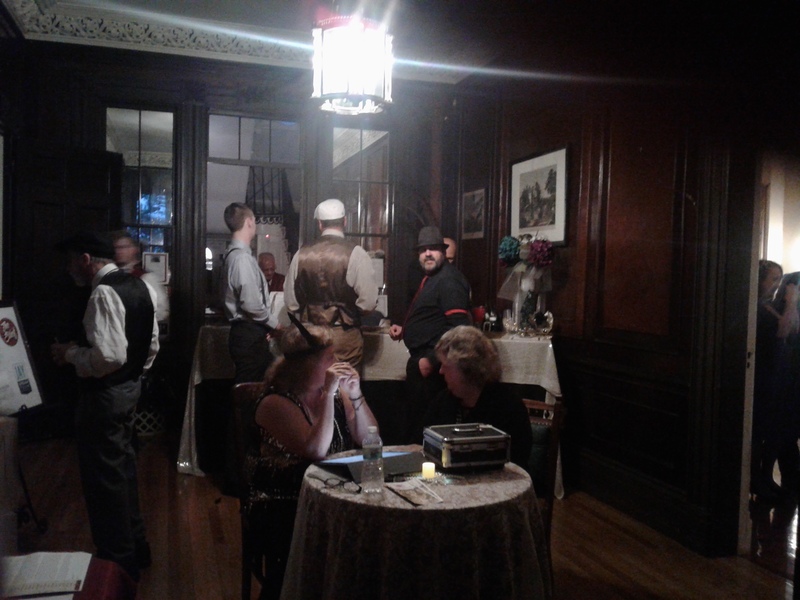 I started out with Rubbed Out at Ruby’s, which was presented at the Overlook Mansion by LiFT Theatre Company. I continued with another activity with LiFT Theatre Company. Now I return to the Overlook to eat cheese, drink wine and listen to the blues. What could be better? I shall close with a shot of the Overlook, which I believe I have used before. Happy Friday, everybody! It is such a beautiful place, I don’t mind showing it more than once. 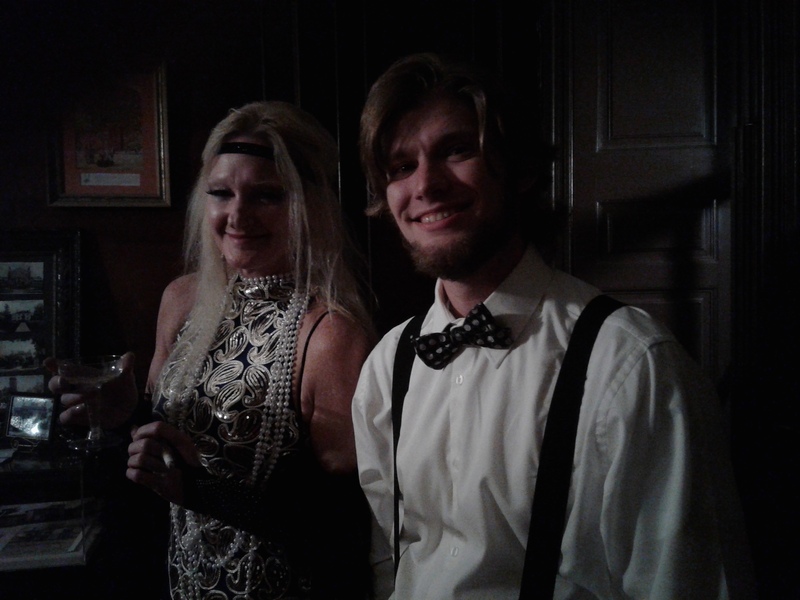 Posted in humor, Lame Post Friday, personal and tagged blog post, fundraiser, LiFT Theatre Company, Little Falls Cheese Festival, Little Falls NY, murder mystery, Rubbed Out at Ruby's, Shakespeare, the Overlook Mansion, The Tempest, theatre, wine and cheese. Bookmark the permalink. Oh, I just knew this would happen. I waited till the last minute to post and now I don’t want to write a good post and I’m not even convinced of my ability to do so. Then again, is that not appropriate on Wrist to Forehead Sunday? I had a matinee of Steel Magnolias at Ilion Little Theatre. Before that my husband Steven and I went to the HALO Chinese Auction at the Herkimer VFW and to Rose Quartz Stand, a gem store located nearby. HALO, for anybody that does not know, is the Helping Animals Live Organization, based in Little Falls, NY, a no-cage, no-kill cat shelter. The Chinese Auction, in addition to being their major fundraiser of the year, is one of the hottest tickets in the area. There were a LOT of people walking around, putting in their chances to win a wide variety of marvelous prizes (I donated an afghan myself). We did not win anything, by the way. Rose Quartz Stand is a business I visited back at Christmas time and intend to go to again. We bought a frog carved from stone for Steven for his birthday (which was Friday) and a dinosaur to keep the frog company (I am a big anthropomorphizer). I intend to write more about the store later, perhaps even doing an article for submission to Mohawk Valley Living, my favorite magazine. After a well-received matinee of Steel Magnolias, Steven joined me and several other cast and crew members for Applebee’s in Herkimer for drinks and dinner. It was a great time. Now I am dying to get back to watching a DVR’d Columbo and crocheting yet another afghan to donate… somewhere. Happy Sunday, everyone. 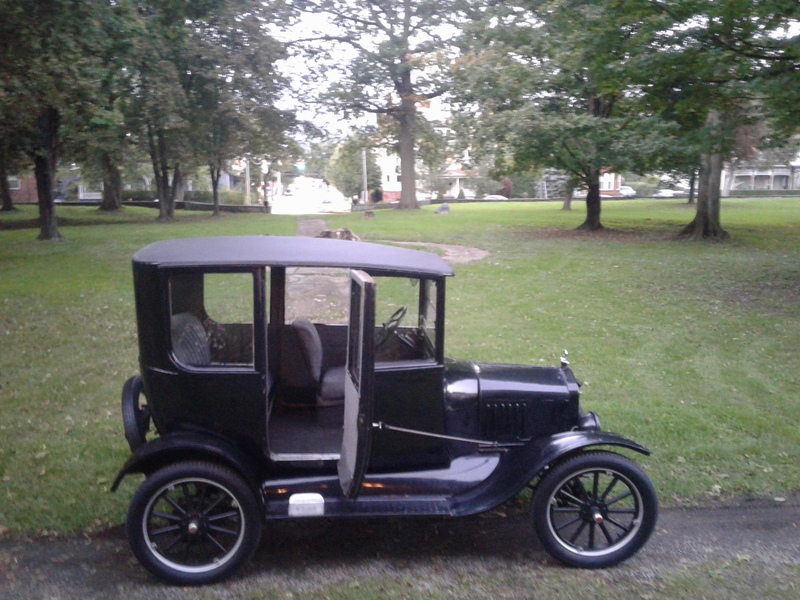 Posted in Community Events, humor, personal and tagged blog post, chinese auction, fundraiser, HALO, Helping Animals Live Organization, Ilion Little Theatre, Mohawk Valley Living magaine, Rose Quartz Stand, Steel Magnolias, writing. Bookmark the permalink. Or should I call this Wrist to Hairless Forehead Sunday? Actually, I am feeling excited about my participation in the St. Baldrick’s Day Event today. It will be fun. Some friends are joining us. We will have some food, maybe a couple of drinks, definitely a lot of laughs, and I’ll get a free haircut. What’s not to like? For anyone just tuning in (and if so, Hi, new reader! ), I am getting my head shaved to raise money for children’s cancer research. The event will take place at Arthur’s in Dolgeville, NY this afternoon from one to three. Thanks to generous friends, family and co-workers, I have raised over $1,000. I’m pretty pleased about that. I did this once before, three years ago. That year I was shaved the first Sunday in June. We had an extremely hot May. I sweated with my stupid long hair and couldn’t wait for the clip! Then the weather took a turn for the worse and we had a cold, rainy June. I wore my toque most of the time rather than show off my bald pate, which was kind of a bummer but what are you going to do? This year the weather has already taken a turn for the colder. I think it’s 20 or 30 out as I write this. I’m debating which hat to bring to the Bald. I have a lovely crocheted green hat a friend made for me some years ago. I also have a black fashion hat I purchased last year at a local consignment shop, Linda’s Consignment Shop in Herkimer, NY. At the time purchased it I said I could wear it if I ever went bald again. Seems kind of ordained, doesn’t it? Oh well, I guess I don’t have much to say about my Bald plans for the day, but I wanted to give St. Baldrick’s Foundation another shout-out, and I wanted to get my blog post written. Mission accomplished, as they say. I hope to see you all tomorrow for Monday Mental Meanderings. Happy Sunday, everyone! P.S. If anyone wants to add to my fundraising total, my page for that is https://www.stbaldricks.org/participants/mypage/813330/2016. For more information on St. Baldrick’s Foundation, you can visit www.stbaldricks.org. Posted in Community Events, humor, personal and tagged Arthurs, bald, blog post, children's cancer, Dolgeville NY, fundraiser, St. Baldrick's Foundation, Wrist To Forehead Sunday. Bookmark the permalink.